1 I’ve Got the Joy 1. I’ve got the joy, joy, joy, joy, Down in my heart, Down in my heart, Down in my heart. I’ve got the joy, joy, joy, joy, Down in my heart, Down in my heart to stay. 2 I’ve Got the Joy Refrain: And I’m so happy, so very happy, I’ve got the love of Jesus in my heart And I’m so happy, so very happy, I’ve got the love of Jesus in my heart. 3 I’ve Got the Joy 2. I’ve got the peace that passeth understanding, Down in my heart, Down in my heart, Down in my heart. I’ve got the peace that passeth understanding, Down in my heart, Down in my heart to stay. 4 I’ve Got the Joy Refrain: And I’m so happy, so very happy, I’ve got the love of Jesus in my heart And I’m so happy, so very happy, I’ve got the love of Jesus in my heart. 5 I’ve Got the Joy 3. 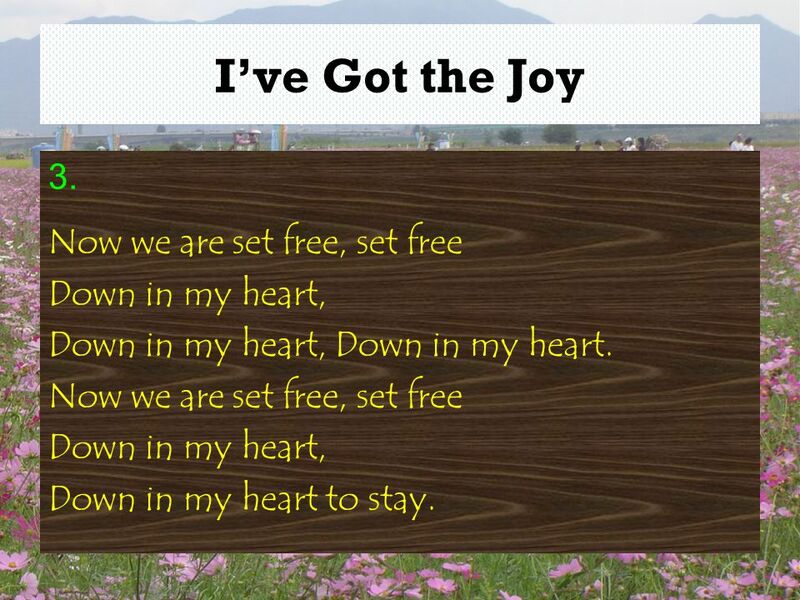 Now we are set free, set free Down in my heart, Down in my heart, Down in my heart. Now we are set free, set free Down in my heart, Down in my heart to stay. 6 I’ve Got the Joy Refrain: And I’m so happy, so very happy, I’ve got the love of Jesus in my heart And I’m so happy, so very happy, I’ve got the love of Jesus in my heart. 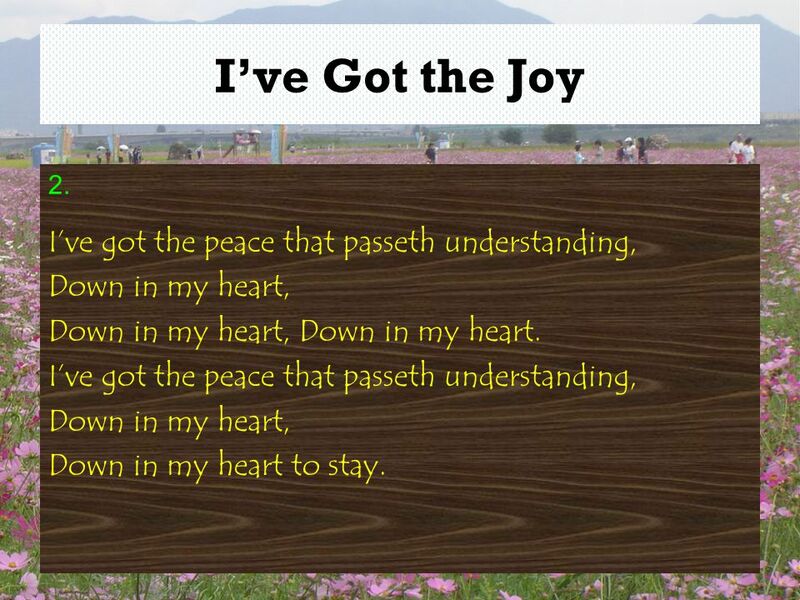 Download ppt "I’ve Got the Joy 1. I’ve got the joy, joy, joy, joy, Down in my heart, Down in my heart, Down in my heart. I’ve got the joy, joy, joy, joy, Down in my." BELIEVERS LOVE WORLD IS A PLACE WHERE WE SHARE GODS WORD REACHING OUT WITH PEACE AND LOVE MAKING PLAIN GODS PLANS FOR ALL BELIEVERS LOVE WORLD BUILDING. Saved Saved, I’ve been saved You have rescued me From where I’ve been And paid, you have paid All that kept me from the life You give O, no greater love. I’ve Found Jesus Well, I hear they’re singing in the streets That Jesus is alive And all creation shouts aloud That Jesus is alive. When I look into Your holiness, When I gaze into your loveliness, When all things that surround Become shadows in the light of You. When I look into Your. Tis So Sweet To Trust In Jesus Tis so sweet to trust in Jesus Just to take Him at His word. Just to rest upon His promise Just to know “Thus saith the. Vocabulary: Around the Pond: Who’s Been Here?. Vocabulary containers containers dangles dangles bark bark caught caught floats floats shallow shallow. I’VE GOT THE JOY I like to dance ‘Cuz I’ve got the joy. Since Jesus Came Into My Heart What a wonderful change in my life has been wrought, Since Jesus came into my heart I have light in my soul for which.